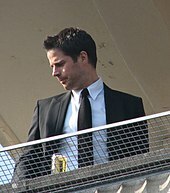 Jamie Redknapp (born 25 June 1973) is an English footballer. He was born in Barton on Sea, Hampshire. He played for Liverpool F.C., Tottenham Hotspur F.C., A.F.C. Bournemouth and Southampton F.C.. His father, Harry Redknapp, is the manager of Portsmouth F.C. Redknapp married R&B singer Louise Nurding in 1998. This page was last changed on 28 December 2017, at 11:41.